Late last year Sarina DuPont from Embarcadero posted an example Delphi XE5 Firemonkey app for using the TRESTClient component for mapping surf spots on Android and IOS. If you are looking to build an app that is REST based this may be a good demo to start with. It features a TTabControl for showing multiple pages and then uses a TListView control to display the actual content. The API that is connects to for the surf spot data is from api.spitcast.com. If you need ideas for other REST APIs to connect to there is the ProgrammableWeb website which lists over 11,000 different REST services. In any event the SurfSpot finder demo app uses a TFDMemTable to store the REST information that it downloads and then uses LiveBindings to display the data in the controls. You can also do the JSON parsing manually using different third party JSON libraries. One not about this demo is that it also displays a map of the surf spot using the TWebBrowser component. The URL that it uses is https://maps.google.com/maps?q=%s,%s&output=embed but you will want to drop the &output=embed from the URL so that it is just https://maps.google.com/maps?q=%s,%s. Google has changed their API which caused this update. 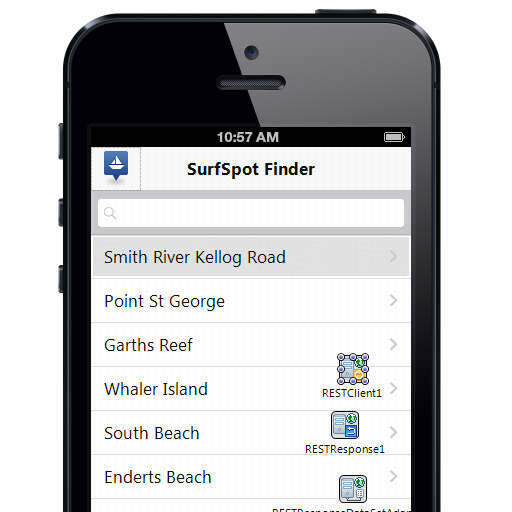 Head over and read the full write up about building the SurfSpot finder demo and download the source code.